ARK: Survival Evolved is a game that I picked up in last year’s Steam summer sale, along with many others. I love me some survival games so I gave it a try soon after in solo mode. I remember Lord Crumb being there at the time and us both commenting on the pretty graphics and the awesome dinosaurs wandering around. I quickly tried the old Minecraft method of punching trees to get resources and began crafting items. This was working quite well for about 10 minutes until something ran over and ate my character. I respawned only to find I had absolutely nothing in my inventory so I begrudgingly began to gather again. And again died soon after. This was just the beginning of a succession of deaths that didn’t appear to have an end. Searching for my body to recover my items was a lost cause because I’d either die to the same creature or another one that happened to wander by. The next strategy I tried was one I had learned from Wurm Online: when outclassed, run like hell and hope you find a safe place. That didn’t work at all. I tried dashing down the beach in an effort to lose a sabretooth on my tail, only to run into a giant scorpion that immediately tore me apart. Running into the sea to escape a spinosaur just ended with me getting eaten by a shark. It didn’t take me very long to abandon the game in frustration. I realize that if I had looked up some guides, I probably could have figured out what was going wrong, but you know how it is when you’re mad at a game. I didn’t have the patience to do any research right then, so ARK got shoved to the side and I went on to play games that I knew would be fun. Almost a year later, I still hadn’t gotten back to ARK. 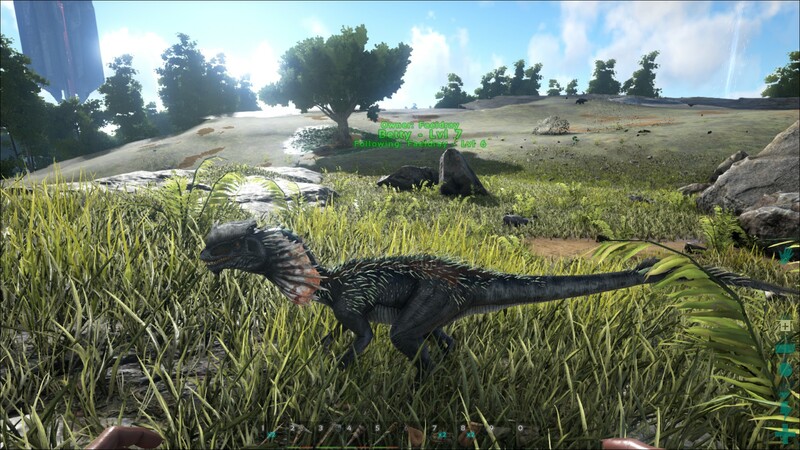 It was only when Tyrannodokus recently began blogging about his (often humorous) adventures in ARK that I gave the game another chance. Armed with Ravalation’s tips for new ARK players, I started a new solo game with a little more knowledge under my belt. The first thing I did was choose a spawn point in the southwest. Why the default is in the northeast is beyond me when any new player is just going to die horribly over and over again like I did. Talk about a way to turn off folks right away. Anyways, this area was much easier for me to survive in and it wasn’t long before I had a few levels, a little shack, and some tamed dilos to protect me and help me hunt. As well as this solo game was going, I still felt like I was lacking information and direction. Since ARK is mainly a multiplayer game, I decided to try out the Massively OP server that Tyrannodorkus was also on. The beginning was a little rough. I died a few times trying to meet up for Tyr, whose base is in the slightly more dangerous southeast. He gave me a set of hide armor and metal hatchet, which I then proceeded to lose through death after only 10 minutes. Several more deaths resulted in trying to recover it (I felt really bad for loosing it) and then I died some more to a roaming spino. Soon after, I managed to tame and saddle a phiomia so I thought I was doing pretty good that time…until a wild raptor found me. Dead (again) and frustrated, I decided to respawn in the south-west and try my luck there. This time around, I managed to tame a dilo and gather enough resources to consider building my own base. (I did die once upon discovering that giant turtles are not to be messed with, but at least I found my body later!) During my exploration, I discovered something amazing about multiplayer: scavenging is a thing. If someone isn’t online for a long period, you can demolish their structures pretty quickly (if you want) and loot any materials they have left behind. Not only that, but their dinosaurs become claimable. 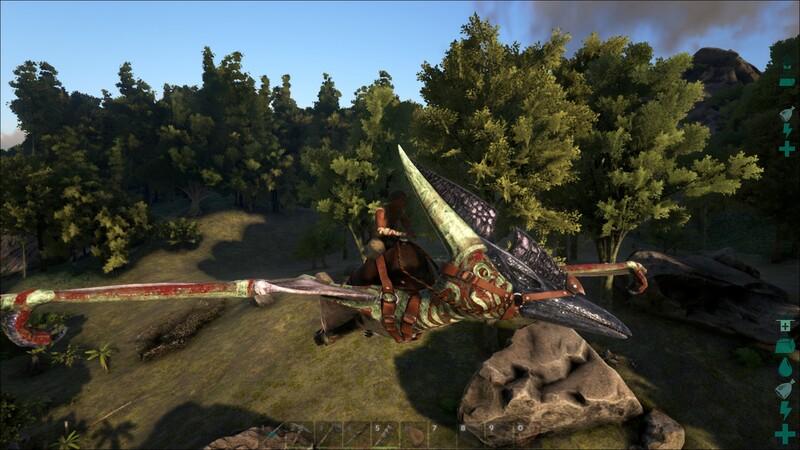 Which is how I ended up with my first flying dinosaur, a level 50-ish pteranodon that I named Seren. Total game changer. Where once it had been difficult to explore for fear of being eaten, I could now just fly around without being harmed. Beacons could be reached with ease, more resources could be carried around. And all I had to do was keep Seren fed with meat. I set about shuttling resources to a new outpost that I started. In one of my gaming sessions soon after, Tyr told me that he had claimed two abandoned saddled dinos, a spino and a T-rex, and I said that I could have one or both of them if I wanted. I quickly flew back to base to give the rex a spin…and may have let the sudden ability to kill everything in my path go to my head. Let’s just say there were claims being thrown around of being a tiny god. I was just getting revenge for all of those previous deaths, alright? And I tried not to be too excited the next time I saw a spino outside base which I promptly went out and murdered with my rex. 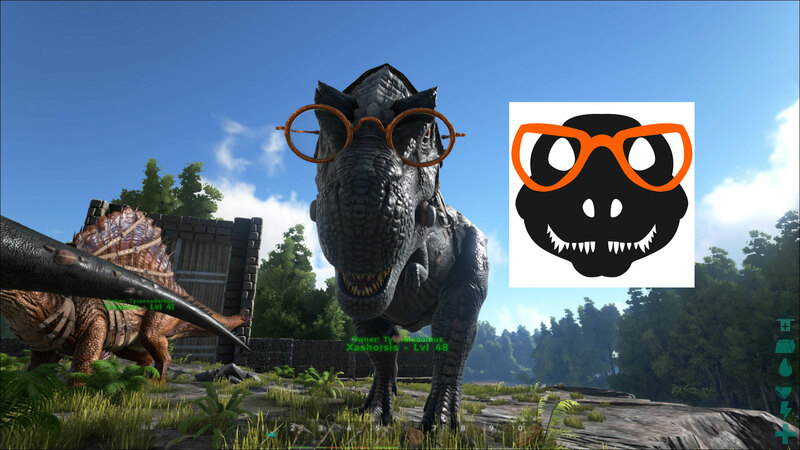 Anyways, I was so pleased with my new rex that I promptly gave him dino glasses. So far, I seem to be pretty good at scavenging. Oh how it brings back memories of searching through abandoned deeds in Wurm Online and taking anything that’s not nailed down. Or even some stuff that was “nailed down” if I was stubborn enough to push/pull the item to my deed. Some of the things I found include a large cache of metal, obsidian, oil, blueprints, armor, tools, a brontosaurus, a pair of argentavis, and another rex. I’ve slowly come to discover that ARK isn’t quite your usual survival game. I went into it assuming it was all about survival, just among dinosaurs instead of creepers and zombies. But the main goal isn’t to try and make yourself or your tools more powerful, it’s about taming dinosaurs and using them to help you progress. A rex can collect more hides and meat in a few minutes than you alone could collect in 1/2 hour. Doeds are really fast at collecting stone and can even do so automatically. Ankylos are fantastic at gathering metal and flint. The eggs of one dino can be cooked and used to reduce the taming time on another species of dinos. This sort of interrelationship leads to a tribe taming all sorts of different dinos. Tyr has already had to expand his base to accomodate all the dinos we’re getting. ARK still needs some additions (like a tutorial of some sort) and changes (hellooooo dinosaur collision detection) but now that I know a bit more, it’s become quite the fun game to play. I still have to build up my outpost some more; right now, it’s little more than a shack with a bed. Time to borrow a doed to collect some stone! AHAH, I very much enjoyed this read. It really is a game changer once you start taming dinos. It’s not like Minecraft where you do everything yourself and with your set of tools, the dinos greatly increase your abilities to survive, but thrive. By the way, I made sure your trike was fed over at the small base, and there’s been another expansion to the main base building so don’t panic when you wake up to a larger building.